Ask a Bay Area resident to describe “Pacific Heights” or “The Fillmore” districts of San Francisco and you’ll repeatedly stumble upon the same adjectives: upscale, Victorian, stunning, even historic. The grand Pacific Heights homes boast luxurious balcony windows, brilliantly crafted gates and ivy-covered walls. Many are more than 100 years old and beautifully illustrate the city’s artistry and craftsmanship. Deep green parks, such as Alta Plaza, overlook scenic city views. 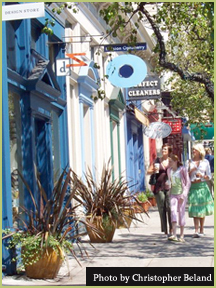 Meanwhile, Fillmore Street defines charm amidst boutiques, restaurants and gift shops. Visit these neighborhoods and prepare to be impressed. For those who desire coffee, literature and fine clothing, try Fillmore Street. The Clay Theater offers independent cinema while heartily brewed coffee can be found at various corners. Quality newsstands provide hip and stylish magazines, such as Wallpaper, Flaunt and Nylon, and the narrow streets create ideal strolling opportunities. The Fillmore is a local favorite for many Pacific Heights residents with good reason.